Theoretical Seismology: An introduction (A. Udias). Modern scientific investigations of earthquakes began in the 1880s, and the International Association of Seismology was organized in 1901 to promote collaboration of scientists and engineers in studying earthquakes. The International Handbook of Earthquake and Engineering Seismology, under the auspices of the International Association of Seismology and Physics of the Earth's Interior (IASPEI), was prepared by leading experts under a distinguished international advisory board and team of editors. The content is organized into 56 chapters and includes over 430 figures, 24 of which are in color. This large-format, comprehensive reference summarizes well-established facts, reviews relevant theories, surveys useful methods and techniques, and documents and archives basic seismic data. It will be the authoritative reference for scientists and engineers and a quick and handy reference for seismologists. 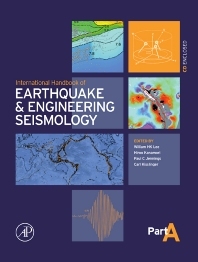 Also available is The International Handbook of Earthquake and Engineering Seismology, Part B.
Geophysicists, engineers, seismologists, and geologists in academia and industry. California Institute of Technology, Pasadena, California, U.S.A.